When a story stays with you weeks after the read, you know a fantastic story fell into your hands. That’s what happened with THE LUCK UGLIES by Paul Durham. Once I cracked open the pages and started reading about Rye’s life on Mud Puddle Lane, I couldn’t put the book down. The story led me on a path of secret rooms and tunnels as truths unfolded in Village Drowning. If you’re not afraid of what lurks under masks and things that roam in the dark, I recommend reading this awesome story! HarperCollins listed synopsis (provided by Paul Durham): Strange things are happening in Village Drowning, and a terrifying encounter has eleven-year-old Rye O’Chanter convinced that the monstrous, supposedly extinct Bog Noblins have returned. Now Rye’s only hope is an exiled secret society so notorious its name can’t be spoken aloud: the Luck Uglies. As Rye dives into Village Drowning’s maze of secrets, rules, and lies, she’ll discover the truth behind the village’s legends of outlaws and beasts . . . and that it may take a villain to save them from the monsters. The first in an irresistible fantasy adventure trilogy that The Peculiar author Stefan Bachmann hailed as “an action-packed adventure with heroes you’ll root for and baddies you’ll hiss at . 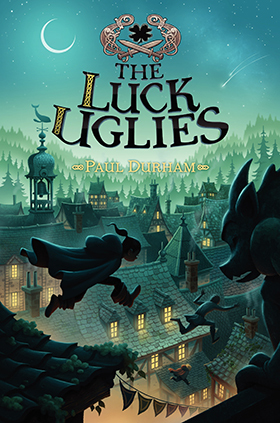 . . funny and magical,” The Luck Uglies overflows with secrets, friendship, and heart—and is imbued throughout with the magic of storytelling. Q1: Did anything particular spark your vision for THE LUCK UGLIES? No singular idea sparked my vision for The Luck Uglies. Rather, the book was a product of various fantasy ideas that had been churning around in my head since childhood. That said, I did have a few rather specific goals that guided my vision as I wrote. First, it was intended to be a book for my daughters (I had never written for children before). Second, it would be fantasy/adventure in a timeless setting. I’ve always had a bit of a personal bias against fantasy set in contemporary worlds, where the protagonists then enter a secret door or portal to another place and time. I prefer fantasy where the authors go “all in” and create wholly unexplored worlds that are unique and immersive, but still familiar and relatable for the reader (I realize that’s a lot to ask for). Finally, I wanted to populate it with characters and creatures that were my own–no fairy tale re-tellings or overuse of magic or mythical monsters. Of course, it’s impossible to avoid all tropes in the fantasy genre–I did plumb the depths of Irish and Scottish legends for inspiration now and then. Q2: With cobblestones underfoot and gargoyles lurking overhead in Village Drowning, I felt taken back to ancient and dark times. Was the village based on a known place during a specific era? That’s a great way to put it–I tried to evoke the feel of “dark times” without pinning Village Drowning to any real place or time period. When I envision Drowning, it is this odd blend of a European city in the Middle Ages and an early, colonial era port town. Readers in New England have told me it reminds them of Portsmouth, a town near my home in New Hampshire. Readers in the UK have said it reminds them of an old English village. I was inspired by both. In fact, there is a picture of a medieval era street in York, England called the Shambles that I used as a screensaver while writing The Luck Uglies. I often sketched with my daughter while writing The Luck Uglies. Early in the drafting, I drew Rye with these big, oversized boots. I liked the visual and it fit perfectly with the theme of following in (or chasing) the footsteps of a parent. It is a theme that will evolve throughout the series. Q4: Village Drowning is surrounded by secrets, and Rye quickly learns her mother is too. Did you find it difficult to write the relationship between mother and daughter as truths unfolded? Most importantly, how did you decide to handle Rye finding out she had been lied to by her own mother? Q5: Your description of the frightening Bog Noblins took my breath away. Did you base the characteristics of the creatures from a mythical being, inspired by a photo, or something evil lurking in your own noggin? Originally the Bog Noblins were just something ominous crawling around in my own imagination (I know–it’s a scary place in there). Then, after reading an early draft, my agent sent along some creepy images of the ancient, highly preserved “bog bodies” that have been pulled out of peat bogs in Denmark and Northern Europe. That helped me to hone in on their leathered skin and red hair. Q6: Quinn and Folly are loyal friends to Rye, often helping her on her quest of discovery. Did you find it easy to keep their traits and personalities separate, or did you have to keep a log to remind yourself? I actually found it relatively easy to separate the children’s traits once I established their basic characteristics. Folly is more of an adventure-seeker/rule breaker, while Quinn attempts, unsuccessfully, to be more straight and narrow. Folly is interested in science–the “potions” she makes are really more chemical reaction than magic. Quinn is the fastest runner on Mud Puddle Lane, but he is also just a fundamentally sweet kid–he may grouse about watching Lottie and Shady, but he always comes through for Rye. Rye, Folly and Quinn were very much inspired by my daughter and her two best friends in our neighborhood (but only the good qualities of course). Q7: And since many writers follow my blog, how long did it take to find your fantastic agent? I’m definitely no stranger to the querying process. I’ve actually worked through the slush piles twice. 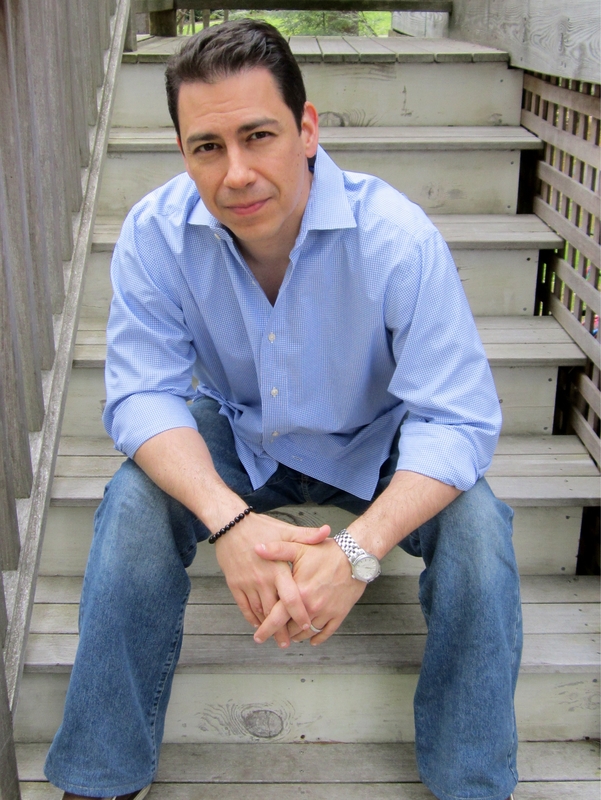 First, ten years ago, my adult crime fiction was represented but never found a publishing home. More recently, I submitted The Luck Uglies to agents for almost a year and collected pass after pass. Without exaggeration, I had truly decided that I’d sent my last query letter when I received two offers of representation in one week. I signed with the terrific Michelle Andelman at Regal Literary and The Luck Uglies was soon on its way. I try to tell this story to every aspiring writer in hopes that it will keep them in the ring. In publishing, it’s often all about finding that first person to champion your work. Thanks so much for including me on your blog and all your kind words about The Luck Uglies. It was my pleasure to answer your questions (they were great ones). Awe shucks, Paul. You’re welcome! Thanks for taking the time to answer! Of course, Paul can be stalked on twitter. Or visit his blog to learn more about The Luck Uglies and how he creates magic writing in a chicken coop (minus the poop)! If you want to purchase the book just go here (US), or here (UK). I promise you won’t be disappointed. Even more fantastic, this was sold as a series. So more of The Luck Uglies will be coming your way! Congratulations Paul! What is your inspiration for writing this book?